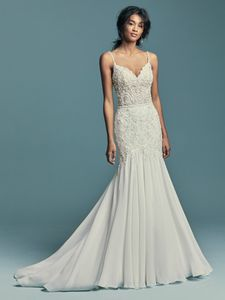 Description: Embroidered lace motifs accented in pearls and crystals dance over this chic boho wedding dress, featuring a sheer bodice (8MC703) or lined bodice (8MC703MC) options to fit a bride’s preference. Beaded spaghetti straps glide from sweetheart neckline to illusion back embellished in lace motifs. Fit-and-flare skirt comprised of Revina Chiffon. Finished with pearl buttons and zipper closure.